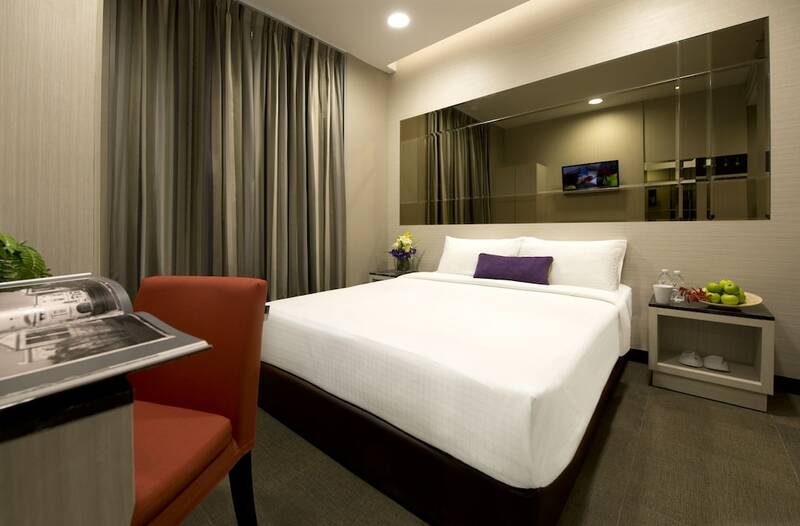 The V Hotel Bencoolen is a fully featured Singapore hotel with 272 spacious rooms and great views of the city skyline. The hotel is in the Bugis district, one of the busiest places with the most popular shopping malls in Singapore. A short distance away are some of the city’s main attractions, namely the National Museum, Krishna Hindu Temple and the Church of Saint Peter and Saint Paul. V Hotel Bencoolen is an also excellent choice on account of its communications, with access by car, taxis, buses and the Mass Rapid Transit system. All guestrooms at V Hotel Bencoolen are all fully equipped with air conditioning, 32” TV with a selection of international channels, Wi-Fi, a minibar, a large closet, toiletries, an electronic safe, a tea set and a desk. The hotel offers different room types, which vary according to the space provided and the number and size of beds. Top of the room list there is the Deluxe room which boasts a terrace, offering great views of the city. V Hotel Bencoolen is complete with public areas, gardens decorated with designer items, an outdoor pool, an internet room with Apple computers, parking and a shopping area providing a selection of shops, local eateries and snacks.